Being home to the Earth’s second largest floating bridge in the world, Mercer Island is occupied by over 22,700 people. Located in the Seattle Metropolitan area, the island was first settled back in the late 1800s and is now known as the most populated island on a lake within the United States. Interstate 90 runs through the northern part of the island and is accompanied by three bridges to make up the route. The island is part of King County and acquires its own unique zip code – 98040. The island has its own City Hall as well as a total of nine schools. Six of the schools belong to the Mercer Island School District (three primary schools, one middle school, one high school and one alternative secondary) and the other three vary in the ages that they serve. Throughout the island there are 475 acres of parks and open spaces. Luther Burbank Park is one of the most popular and it contains many different activities for people to enjoy: public boat dock and fishing pier, a swimming beach, an amphitheater, tennis courts, barbecues and picnic tables, and an off-leash dog area. Pioneer Park consists of 113 acres of open areas, hiking trails, a children’s park and much more. 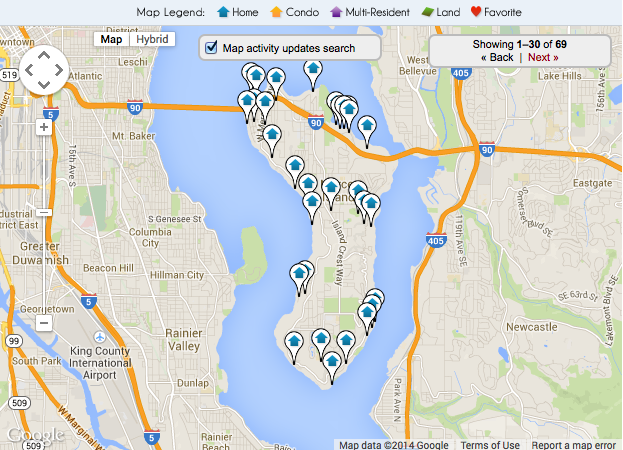 There are plenty of options for people who are interested in obtaining some real estate on Mercer Island. Whether it’s a cozy condominium or a spacious house, there is bound to be something of interest for those who are looking. There are a number of Mercer Island homes for sale that range from half a million dollars to multi-million dollar waterfront homes that provide a scenic view of Lake Washington. For those who are interested in Mercer Island condos for sale, the sizes and prices vary, but they are guaranteed to offer countless amenities and nearby attractions. Floods Lakeside Tracts Div 5 Bldg. Floods Lake Side Tracts Bldg. Floods Lake Side Tract Bldg.